oh October...how much do i love thee? not only do i celebrate my brothers and mothers birthday in this month, but you also bring me Halloween. my absolute fave!!! yes i am one of those adults who still dresses up and when i actually owned a house, i would race home from work, dress up, and sit outside ready to deliver candy to all the little cuties out there. when my ex and i separated, we lost the house. he actually kept pretty much everything in it including my beloved decorations. as i have mentioned before, life was a bit hard for me in the years that followed and i couldn't really afford any extras. but i couldn't very well not pay homage to this day could i? i pretty much raided every dollar store in my city to come up with some kind of décor that i could put up. this year things are a bit different for me. financially i am a bit better and i am currently in the process of moving into boyfriends house as our wedding is around the corner...eeeeeekkkkkk!!!! in a house where the xy chromosome reigns supreme with 3 dogs, two boys (note: the boys are from boyfriends first marriage but are the eternal loves of my life), and boyfriend i am trying not to over power this house with Hello Kitty décor. while bats and spiders can take over the house during this time, i wanted to add something that would take me through the end of fall as well. enter my #fabfind from Marshalls! i found these great fabric flowers with an adhesive square already in the back. at $1.99 each down from $5.00 at their original price, i couldn't really pass them up! i already had some ribbon at home so all i really needed were the pumpkins. first wipe down your pumpkins with a mild cleaner or just some water. then take your flowers and just kind of hold them up to your pumpkin and decide where you want them to go. 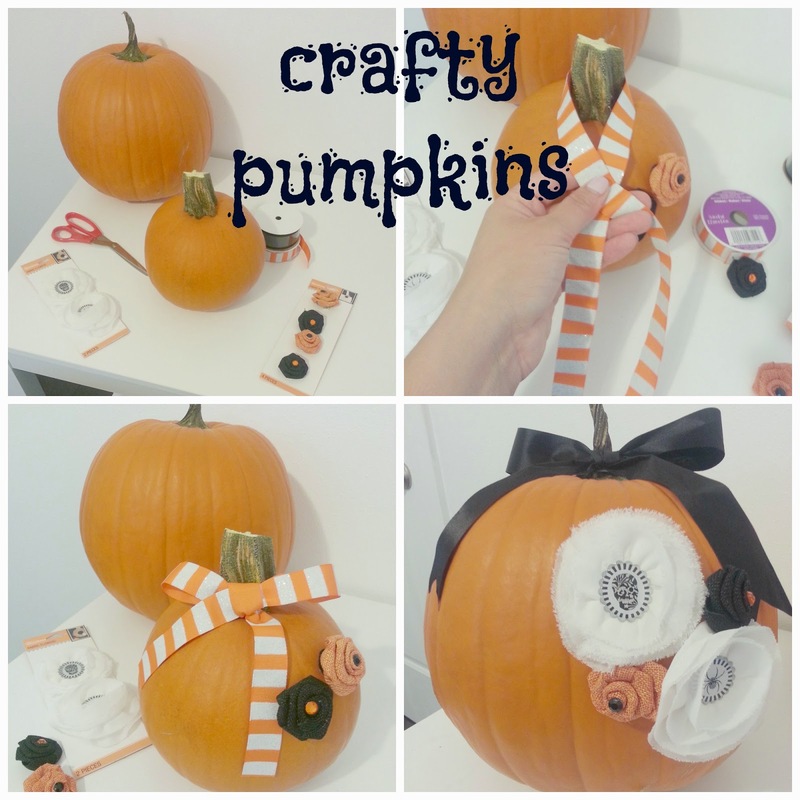 next, peel the adhesive square on the back and press it against your pumpkin. i added 2 to the small one and then wrapped some ribbon around the top of it. i don't think it is coming across in the images but the ribbon actually has silver glitter on the white part. i pretty much did the same thing with the big pumpkin. and 5 minutes later i had my #fabfind pumpkins. i really like the way they came out and the best part is that after my pumpkins are long gone, the supplies i used can be reused for next years. once again Marshalls to the rescue. i think we'll head out to a pumpkin patch this weekend with the boys so they can make their own. do you prefer to make your own decorations or buy them already made? be sure to tag me @lifeinmascara on Instagram so i can see what crafty things you are up to this weekend. happy crafting everyone!